Martin qualified as a Chartered Legal Executive in 1998 ( with 13 years prior legal experience) . He then undertook the LPC and was admitted as a Solicitor in February 2014. He has always worked in private legal practice. In 1985 he commenced employment in a West London practice undertaking High Court Litigation. 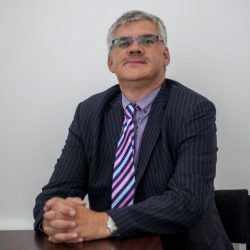 In 1987 he worked as a Civil Litigator in a Greater London practice undertaking agency advocacy in County Courts in the metropolitan court circuit, as well as conducting a Civil Litigation caseload. In 1997 he moved to a Hampshire High Street practice where he remained until February 2017. He continued to conduct a wide variety of litigious disputes predominantly: Housing, Landlord and Tenant, Boundary Disputes, Orders for sale under the Trusts of Land and Appointment of Trustees Act 1996, Contractual Disputes, Personal Injury, and Tortious disputes. He is a very experienced advocate in the County Court and represents clients in dispute resolution meetings by mediation. Up until 2001 he conducted a criminal caseload. He was head of litigation for 5 years and an associate at the practice. He has acted for both commercial and private clients. He has also acted for a government agency for 14 years undertaking residential possession claims. His objective is to achieve early settlement by negotiations and to establish the clear objectives together with the clients expectations at the outset, with litigation to be commenced as required. In his spare time Martin belongs to the WWT. He enjoys cycling and sea kayaking.